"The Grand Strand," a phrase coined by journalist Claudette Dunnegan in 1949, refers to a stretch of beach that runs almost 60 uninterrupted miles from Georgetown to Little River South Carolina, near the North Carolina border. 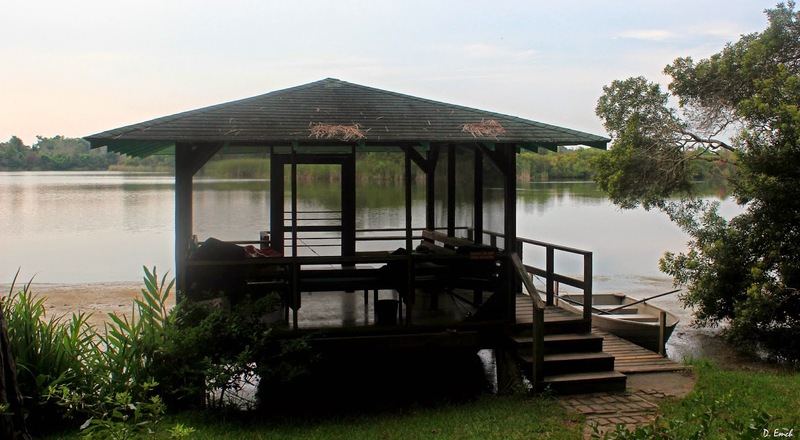 Just north of Georgetown we saw three areas that were undeveloped - Hobcaw Barony, St. George and a small state park leased to South Carolina by Brookgreen Gardens. Once passing Brookgreen, the development along the shore runs uninterrupted for about 30 miles, quickly changing from single family beachfront houses to a long line of high rise hotels and condos. But right in the middle of this string of hi-rises there is one small spot left largely undeveloped - a striking contrast when viewed from the beach. 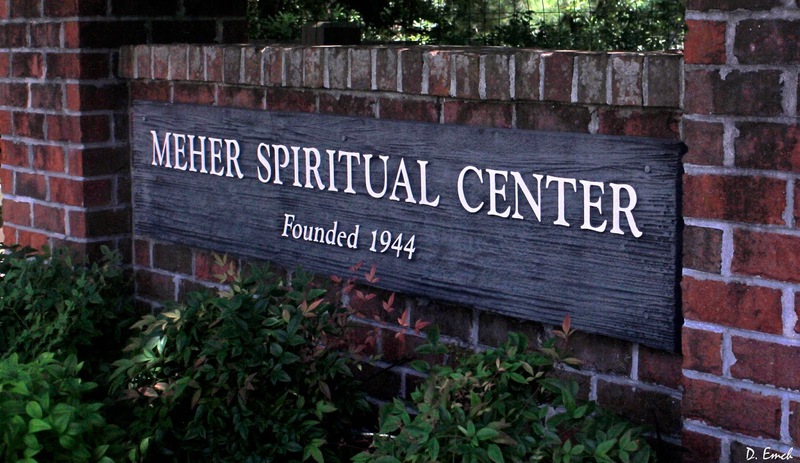 Welcome to the Meher Spiritual Center, a place for rest, meditation and renewal of the spiritual life. 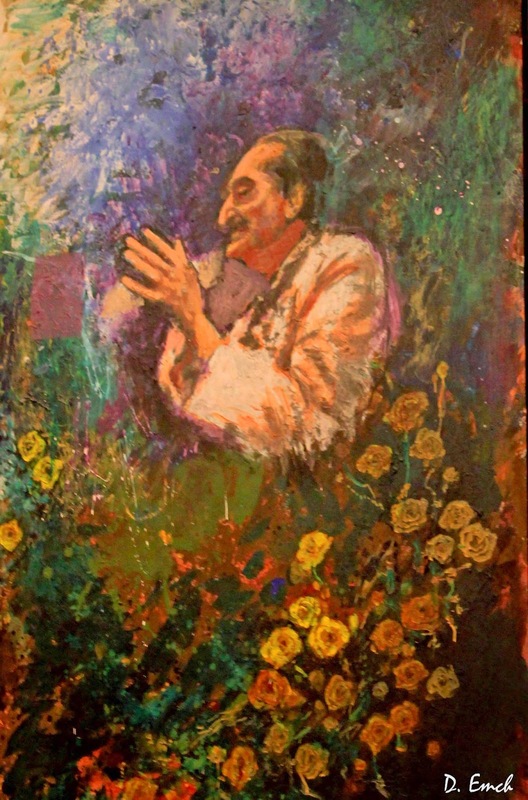 Its 500 acres are dedicated to the spiritual life described by its namesake - Meher Baba. Born in 1894 in India, Baba was an enlightened spiritual master who brought Hindus, Buddhists, Muslims, Christians and others together in unity - not an easy feat during those trying times in that part of the world. Baba is said to have been an enlightened "god-man" in the tradition of Krishna, Buddha, Jesus, Ram, Mohammed and others. Reading through the diaries and journals of those who knew and followed him, there were countless things that happened around him that far exceeded the bounds of coincidence. During my week-long visit, I met folks who came to the center from Germany, Switzerland, Iran, England, Australia, Thailand, Israel and from all over the Americas. Of note regarding his followers, they do not actively proselytize - rather new followers come by being attracted through the actions of those who follow Baba's teachings. Many of the "Baba Lovers" (as they refer to themselves) also know and love other religious traditions. 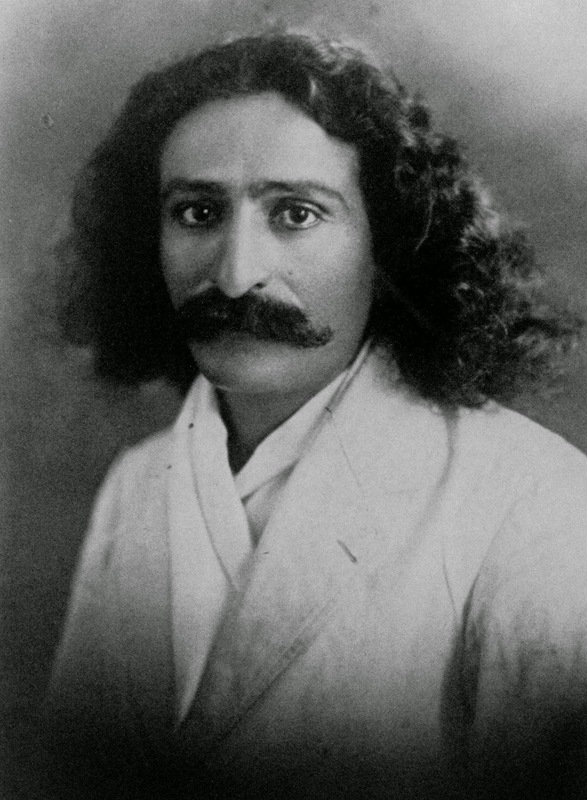 But the thing that I found all had in common is that they all have had deeply personal and profound spiritual experiences directly related to their exposure to the teachings of Meher Baba. He was revered by highly respected leaders of all of those religions, and several letters and transcripts detail interactions that took place when he was sought for council by Gandhi during his struggles to attain self-rule for India from the British. Starting at the age of 19, Baba underwent a 7 year period of deep spiritual transformation, and at 27 he started developing a following. At the age of 25, Baba took a vow of silence which he maintained until his death 44 years later, saying that enough words had been spoken already. He said he was not here to teach, rather he was here to awaken people to their spiritual potential. He communicated with hand gestures and by using an alphabet board, and through his closest followers he dictated numerous books and much correspondence. Baba was a strong voice early against the use of illicit drugs, and urged people to reach their potential through forgetting self and immersing themselves in the service. His core message was love, and he taught that if one wants to love God they need first love their neighbor. To this day his followers number in the hundreds of thousands, spread out across Europe, Asia, the Americas and Australia. Baba's instructions for the center were that those who love him and those that want to know more about his teachings are welcome here. The center itself consists mostly of unspoiled lowland hardwood forest. 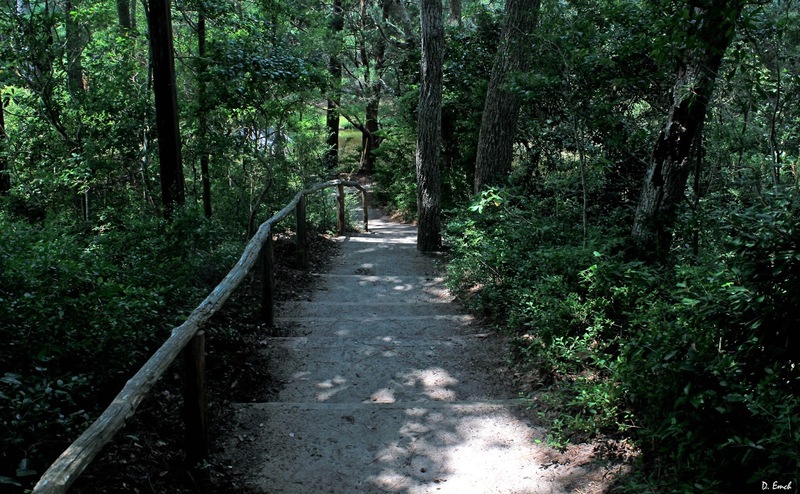 Miles of trails run through the property and wildlife abounds. Bordered by high rise condos, a Walmart, a large shopping center and a dense residential community, it really is an unexpected oasis. 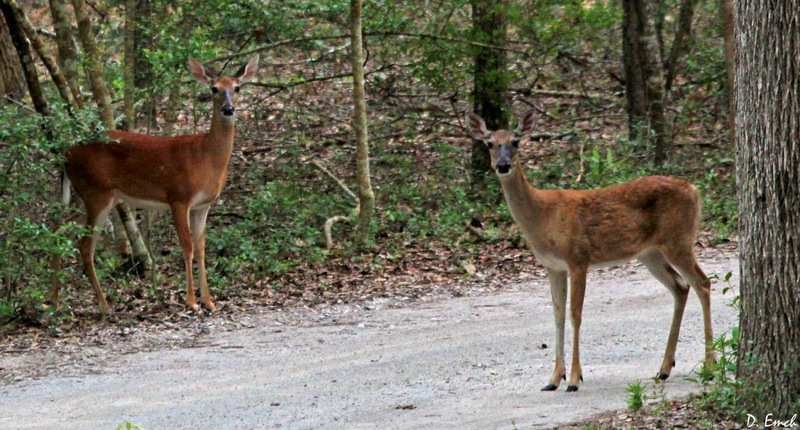 Wildlife abounds on the grounds, and even the deer seem to be pretty relaxed. 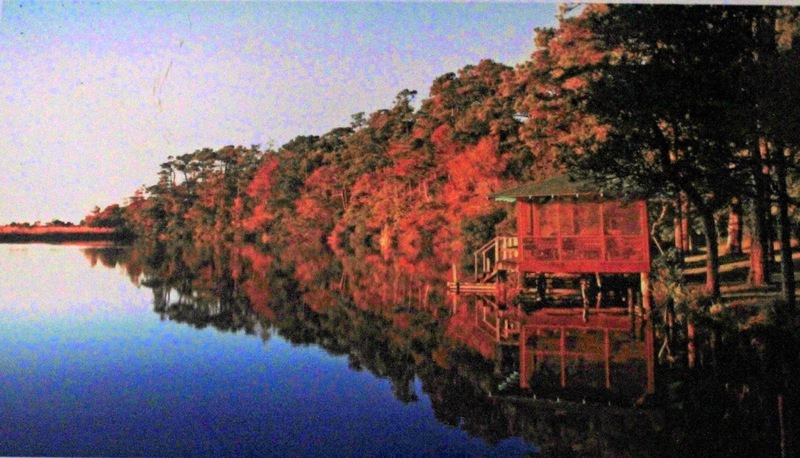 One of the unique features is a large freshwater lake that runs parallel to the ocean for most of the width of the tract. This body of water was the reason this place came to be here in the first place. In 1941 a group of Baba's Western followers set about to find a place for a spiritual center in the United States. Baba had instructed that a center should have ample fresh water, virgin soil, equitable climate and soil that could be made to sustain a large population. Because of the lake's proximity to the ocean, this stretch of land was not as easily developed as the other stretches of beach. So, Elizabeth Chapin Patterson, daughter of one of the partners that developed this portion of Myrtle Beach was able to secure it for the center. She along with Italy's Princess Norina Matchabelli co-founded the center in 1944. 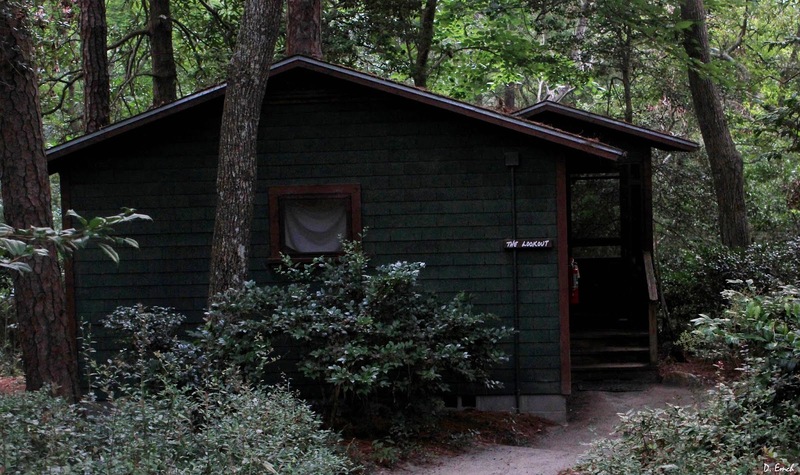 Numerous cabins and community buildings are nestled in the woods along the inland side of the lake. 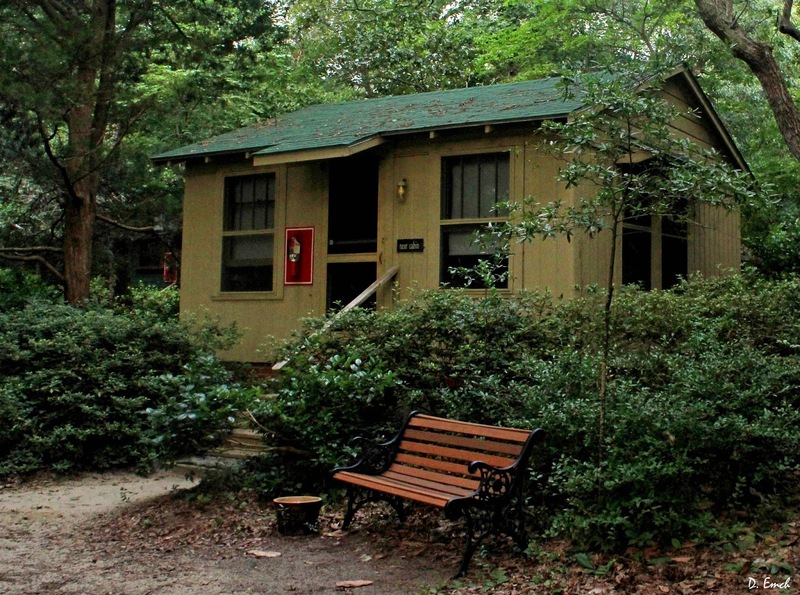 Some of the cabins have their own furnished kitchens, and there are also two large fully furnished community kitchens available. 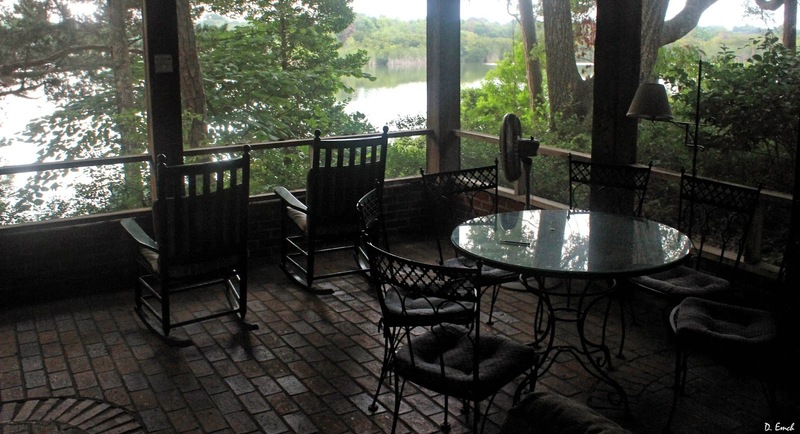 This one directly overlooks the lake. 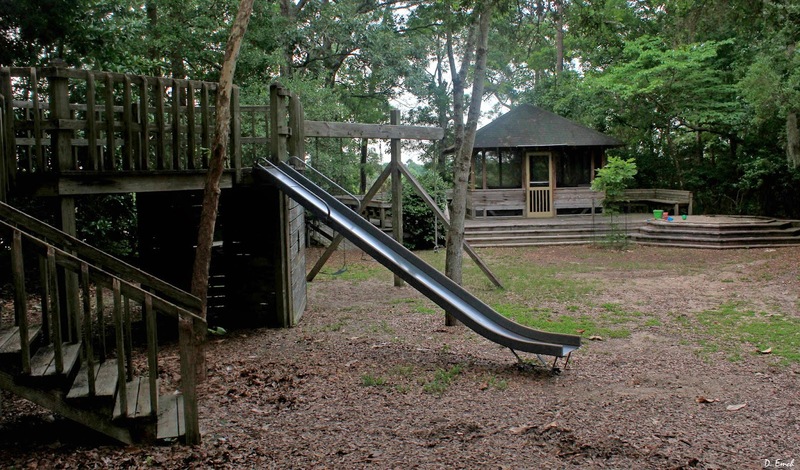 There is ample play area for children, and numerous quiet areas, both indoors and outdoors that invite prayer and meditation. Unique pieces of artwork abound. 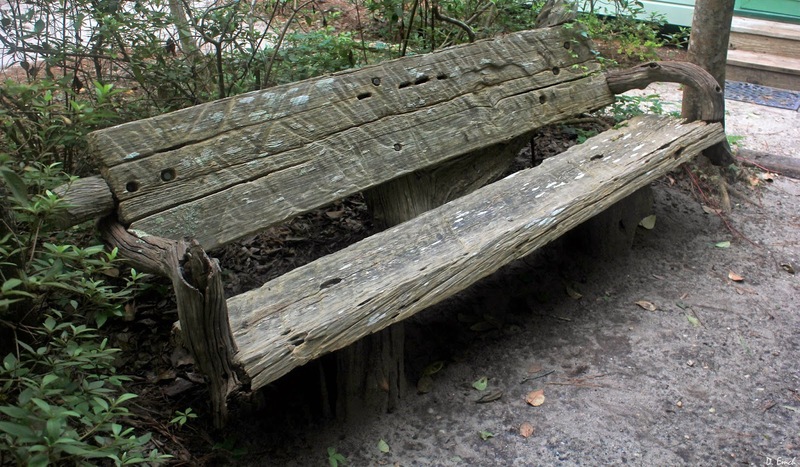 I absolutely fell in love with these benches built from driftwood and timber. 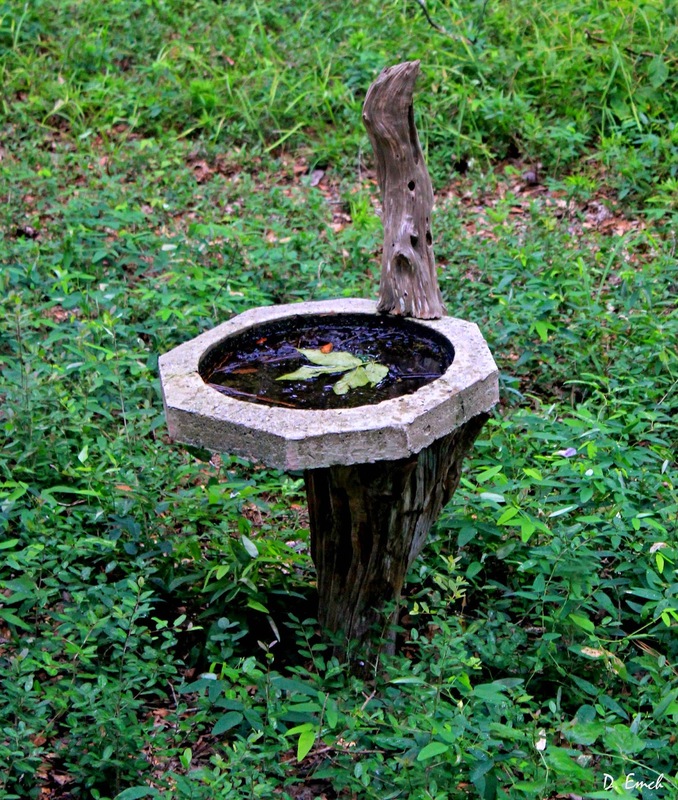 Even a birdbath is built with the natural look. 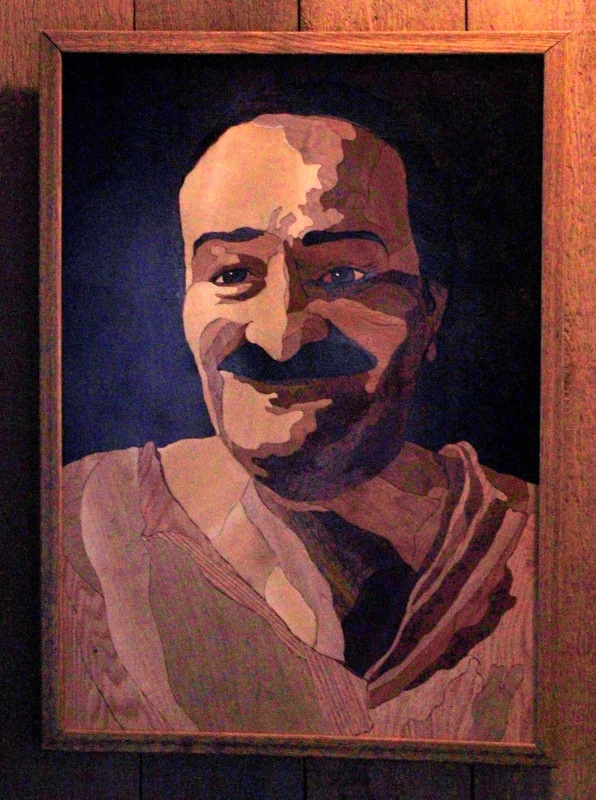 And also the many paintings and other likenesses of Baba are works of art. 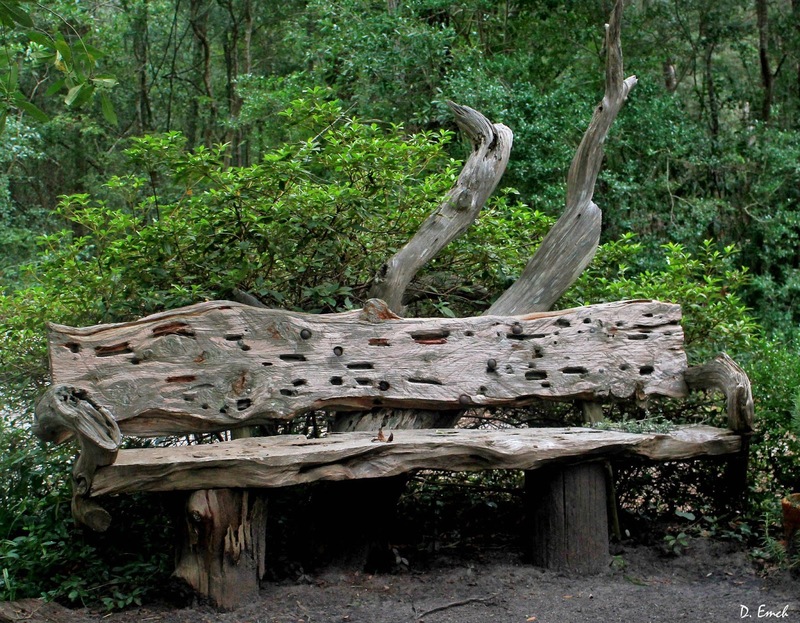 This one is made entirely from different pieces of wood. Even his hair is made from a wood with a grain pattern that makes it look like hair. This photo doesn't do it justice. On top of the many books that Baba wrote on spiritual topics, there are many books written by others relating their experiences in his presence. 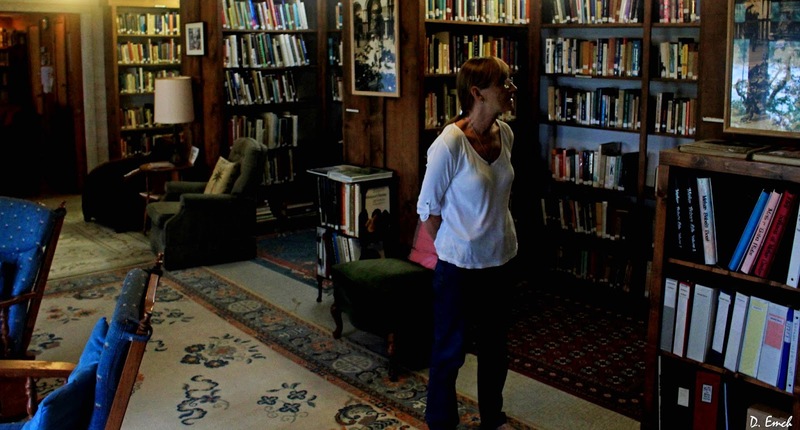 There is also a library with a good selection of other religious and spiritual texts along with books detailing local history, flora and fauna. If you go to the Baba Center, check your ego at the gate. People are calm and low key, and most are here to spend their time quietly in reflection or seeking deeper spiritual understanding. All that I met were quite keen and would engage in a large variety of topics dealing with humanitarian, health and social issues. But I did not hear anyone trying to persuade anybody else of anything - political, religious or otherwise. It is exactly what Baba envisioned - a place perfectly maintained for spiritual rest and restoration. There are community "tea times" in the afternoons and various musical programs, study groups, talks and films in the evenings. Attendance at anything is quite voluntary. There are also a large number of Baba's followers who have moved into neighborhoods close to the center in order to be able to participate in volunteer work or just to be around the atmosphere. Outside visitors can come on the center from 1 to 5 pm and from 7 until 11 pm to attend evening programs. Today's parting shot comes from Highway 501 just as you enter Myrtle Beach. 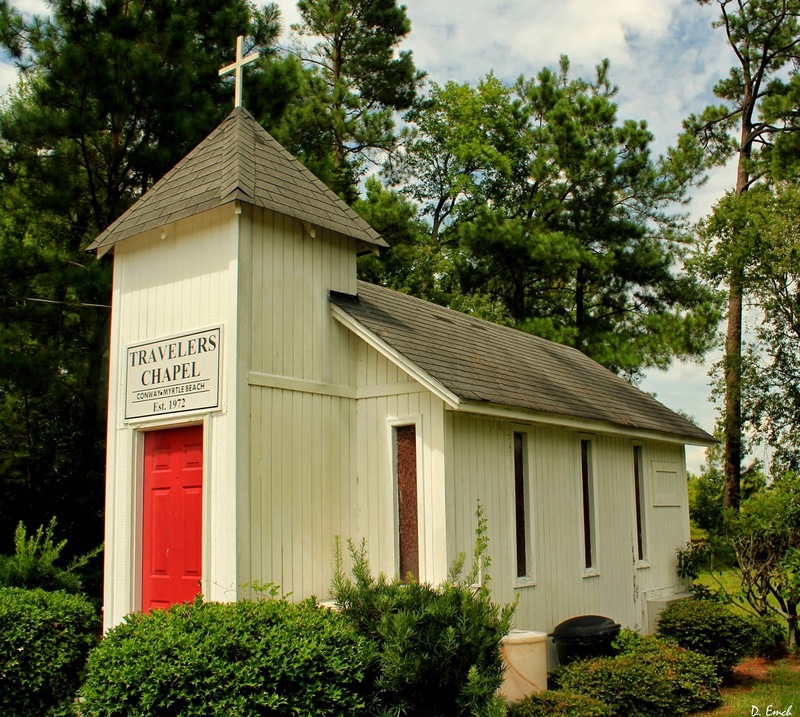 A small chapel sits alongside the road that you will miss unless you are looking for it. 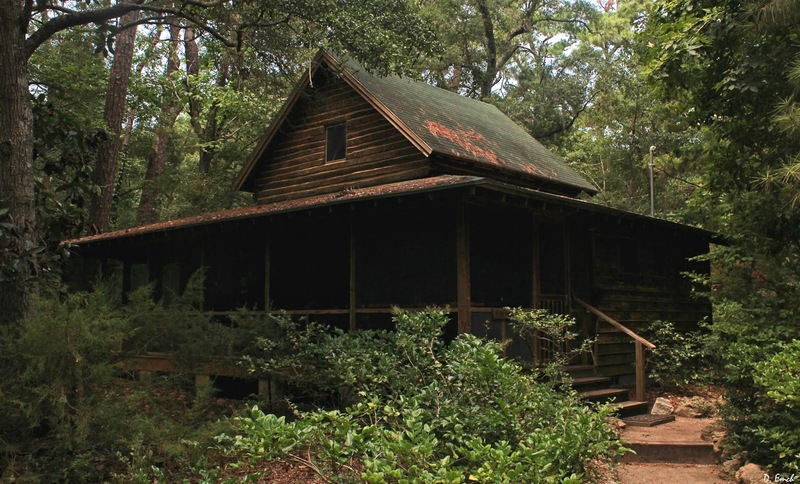 It is reminiscent of the Praise Houses on St. Helena Island. The church was inspired by a similar roadside chapel in Washington State. 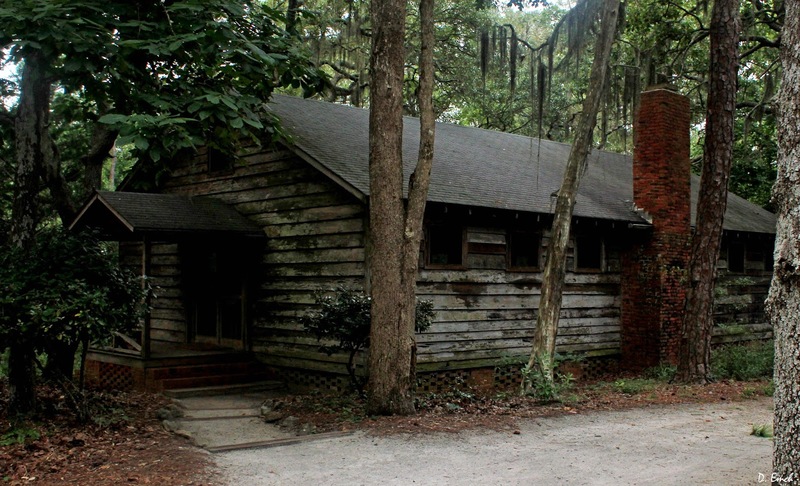 It was built in 1972 and has been rebuilt twice after a tree fell onto it and vandals burned it. The chapel is never locked, and there is seating for 12 inside. There are stained glass windows, an air conditioner/heater that maintains a good temperature, spiritual literature and a small donation box. I am told that hundreds of weddings have been performed here. If you are headed into or out of the hustle and bustle of this resort town, it is the perfect place to force yourself to stop, take a few deep breaths and refocus on what is truly important. Have an awesome Monday !! If you would like to contribute to this journey or to the foundation, just click Here. If you have no idea what this is about, Click Here and Here. Click here to email me, and if you want to read today's meditation just click Here. Thanks for your interest and support !! I've been going to the Center since I was 11 years old. My teenage children, who are under no pressure to consider themselves Baba lovers, love it as their home away from home. This is a miraculous place of deep healing and retreat, highly recommended for anyone who needs some time apart from the rest of the world. For further information about reservations write gateway@mehercenter.org.